There are few books with so much information packed into so small a space. Whether for the interested amateur or the practising astrologer, this is a book to be kept handy and referred to constantly. Destined to become a classic. What Houlding's expert manuscript reveals is the basis for the houses. Several mythological observations come as a surprise, but resonate so powerfully as to be newly appearing touchstones in astrology. She has produced a new standard-bearer, one that will become a reference to writers and astrologers everywhere. This is more than a historical treatise. The book concludes with wonderful clarity on the meaning of houses, leaving the reader with a profound understanding of the core attributes of each house. 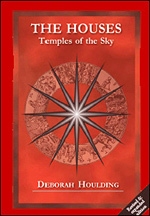 Temples is at the forefront of astrology's need to take stock of the basic principals and encompass its roots.